“Red Faction Armageddon” is the newest game in the “Red Faction” series, but a lot of people don’t think it does the series justice. I would have to agree on some parts. Some of the older games were sandbox style, which is to say, you can go on a killing spree in the game and progress with the story: Basically, you can do anything you please. This time, the game is much more linear. There’s no more free roaming action and, while you can explore the map you are on, you can’t backtrack. The shooting aspect of the game isn’t too terribly bad for a third-person shooter. The story itself is pretty good as well. The graphics are amazing, though sometimes the game engine itself can cause problems. The enemies in the game are masterfully rendered, and the sounds let you know if something is coming behind you, though at times it seems like you don’t have any time to do anything about it. The environment is also done very well. And now, on to the destruction. Many games let you blow up a lot of things, usually cars and little things along the side of the road, but have more of a story involved, or less, depending on the game. 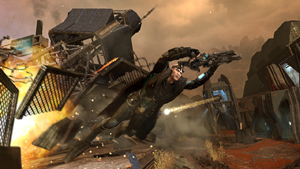 With “Red Faction: Armageddon,” meaningless destruction is a way of life. The best way to get money in “Armageddon” is to destroy buildings and generators. As a plus, you can rebuild almost everything you destroy with the nano-forge. The nano-forge is a wrist-mounted factory that shoots out nanites — tiny machines that will repair any man-made construct you have destroyed — though it doesn’t work on buildings that have been infested by aliens. There’s even a game mode that focuses on completely destroying everything around you as fast and as spectacularly as possible, with a point-based system to track your childlike ability to wreck anything and everything around with no regard to ammunition. Needless to say, that’s a lot of fun, and there are six stages for you to smash to your heart’s content. The problem that the engine faces with dealing with the destruction is that sometimes something you’ve rebuilt will start to fall apart if something moves on it. I had rebuilt a bridge then bumped a crate, which made the panel I was standing on disappear, which in turn made me die. That tends to get annoying at times, I must admit. Other times, even if you destroy a man-made structure, you can’t rebuild it, because it starts to fall apart immediately. Other than the destructible landscapes, there’s actually a story involving aliens, cultists and angry colonists. The basic story is that you are trying to stop some cultists from destroying the terraformer that keeps the surface of the planet from becoming a stormy wasteland. Unfortunately, they succeed in their mission, which sends the entire population of Mars underground, with short stints on the surface for mining operations. Sometime later, protganoist Mason gets tricked into breaking a seal in a temple, which releases a whole mess of aliens. Aliens that want you on a platter. The aliens range from simply annoying to devastating in their power, and the game gets difficult at times, even on normal difficulty, and sometimes the autosave function will screw you over in ways that should be illegal. One time I had to go into a boss fight where I could only take a single hit before I died, and that’s not easy at all. Aside from that, you have the ability to augment your prowess in battle by paying money, called salvage. One of my favorite examples of said upgrades is Berserk. Your weapon damage and accuracy go way up, and if you take Berserk further, your nanites simply make ammo for you to waste during the time that you’ve gone completely crazy. Another one that you will be sure to get is called Autopsy, which gives you money every time you kill anything, even though the amount is nearly negligible at two to four salvage per enemy on average, so you still have to go around and destroy things. As for the weapons, the lineup is fairly imaginative. Your melee weapon of choice is a motorized sledgehammer called the maul that lets you destroy any building with ease, and it even works on enemies. If you don’t want to look at a body while you’re wrecking the town, use the maul, hit the corpse with it, and it suddenly disappear s in a red spray. I want one of those hammers. Overall, the game is really fun even if it is fairly short. However, if you spend enough time breaking stuff, it will last for weeks because, there’s just that much destructible stuff in the game. The boss fights are pretty harrowing as well, especially the last boss in the game, though defeating it doesn’t mean it’s the actual end. It just takes you in one big freaking loop to the very spot you started the game in, but this time to fix things. As for the multiplayer, there is no player versus player mode, but there is an infestation mode, where you have to survive as long as you can against hordes of aliens, and you have to get ammo packs from the ground as you normally would through the game, though you get to choose from any weapon in the game once you unlock them in the main story. I would recommend the game purely for stress relief, though sometimes it will make you angry just because it can just be that hard. That being said, beating the game even once will give you the most hilarious weapon ever: Mr. Toots. Think Ace Ventura. Seriously. I liked it, and I even paid the $5 for ruin mode even though it’s a rental. The game is totally worth it.